Boy, 3, found playing by dead parents - what to do if you see this? Kids like Devaraj are orphaned daily. What can we do, as members of society, to help these kids? Here is what to do if you come across an abandoned child. 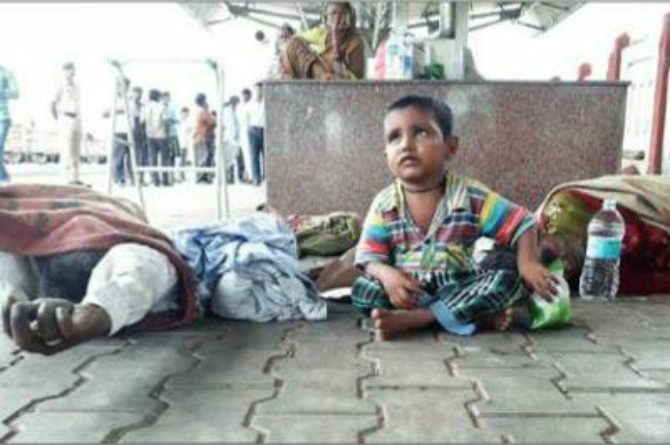 I read the sad story of Devaraj Talawar, a three-year-old boy who was found on the Munirabad railway station of Karnataka on Monday morning. For those unfamiliar with the story, Devaraj was sitting patiently next to his mother and father on the platform, waiting for them to wake up. They had travelled all the way from Gadag to visit Huligemma temple. The sad part is, both of them would never wake up again. According to the media reports, the cause of death of the parents is unknown, but it looks like they decided to end their lives. Passers-by alerted the railway police, and they have contacted a few relatives. The future of Devaraj looks bleak. Many children like him are orphaned every year. Many more are abandoned on railway platforms, bus stations and temples. A study conducted by an international children's charity states that there are close to 2 lakh orphans and abandoned children in India. The shocking news is, only 3 in 1000 of these are real orphans. These children often end up being homeless and are a victim of violence, drug abuse and sexual abuse. Many of them are recruited for criminal activities at a very young age. Bright future ends up becoming a dream for them. Even if they escape all this, they end up being employed as child labour. Human trafficking is also a real threat to these children. Though all is not lost. We recently ran a story of one such homeless kid who was rescued by an orphanage. Amin Sheikh is all set to open a Cafe in Mumbai where he will be employing other homeless people. This gives a hope to someone like you and me because all is not bleak. If we come across someone like Devaraj, we can ensure his safety. Here are a few things you do if you come across an abandoned child. Ask him his name, phone number or address if he remembers. Spare a minute to call his parents/guardians and inform them about his location. Talking will pacify a lost child. Assure him that he is safe now, and some action would be taken. Let the nearest police station know about the lost child. If you are in a hurry, take the kid to a shopkeeper nearby. Most of them may not refuse to help. If neither works, call 1098, the Child Helpline, and let them know the description of the child. Contrary to the popular belief, the Special Juvenile police units are quick to respond. You can later write to the National Centre for Missing Children to report the missing child. If you are on a train, you can tweet about it to the Ministry of Indian Railways (@railminindia) and the Railway Minister, Mr Suresh Prabhu (@sureshpprabhu). A tweet went viral and helped reunite three kids with their mum. The child will be handed over to an NGO or an orphanage. You will have a peace of mind that you saved a soul from the shackles of homelessness. What more can you do to help children like these? Read on to find out. If you have time or money to spare, visit your nearest NGO or an orphanage. They are strapped for resources and any help would be welcome. You can participate in enrichment drives where you teach these children, or just read stories to them and engage them to be curious. You can specify the purpose of your monetary donations. Many such donations also qualify for a tax rebate. 4# Adopt an older child. I know, this is a tall order. Adoption rates in India are low and there is still some stigma associated with it. But if you are thinking of adopting a baby, adopting an older child is also a good idea.There are a lot of parents who want to adopt infants and toddlers, but very few end up adopting older children. Children below 10 are at an impressionable age and your love, care and protection would go a long way. Do your bit for the society and you plant a seed of a safer, more caring society for your children to grow up in.